For five years, I've been an investing analyst and have continued to improve my analysis/knowledge base/approach. That's helped me improve my retirement portfolio, shifting from higher-risk strategies to more effective and safer ones based on deeply undervalued blue-chips and SWANs. This article highlights my current retirement portfolio strategy, which is how I'm running my fast growing life savings right now. AbbVie, Tanger, Bristol-Myers, CVS Health, and Walgreens are five of my top ultra-value, "fat pitch" blue-chip dividend recommendations right now. But due to my portfolio's risk management rules, CVS, Walgreens, and Bristol are the only companies I have limits on right now for as long as the yield curve remains positive. Back in September 2017, I began tracking my retirement portfolio on Seeking Alpha (my real money portfolio where I keep 100% of my net worth and life savings). While I've been investing for 23 years (since the age of nine), I've only been a professional analyst for five and have been driven by a continuous desire to improve my knowledge base, analytical skills and methods. That's due to my natural inclination to always strive to be one of the best at anything I do (in college I was in the top 1% of my class and I was accepted to one of the most prestigious medical schools in the country). That ceaseless hunger to always up my game is why I was able to leverage my start at the Motley Fool to a thriving career on Seeking Alpha (now the second most followed author on the site after just 2.5 years), a partnership with the Mesh Trading Group and Brad Thomas, and an analyst job at Simply Safe Dividends. Most importantly, over time I've come to learn that the best way to earn great investing returns is with a value-focused approach to blue-chip dividend stocks. That's why, as my articles have focused more on lower-risk blue-chips and SWANs, my success rate has sky-rocketed. That has vaulted me into the top 0.6% of all analysts tracked by Tipranks, 5,500 of whom are professional Wall Street analysts. 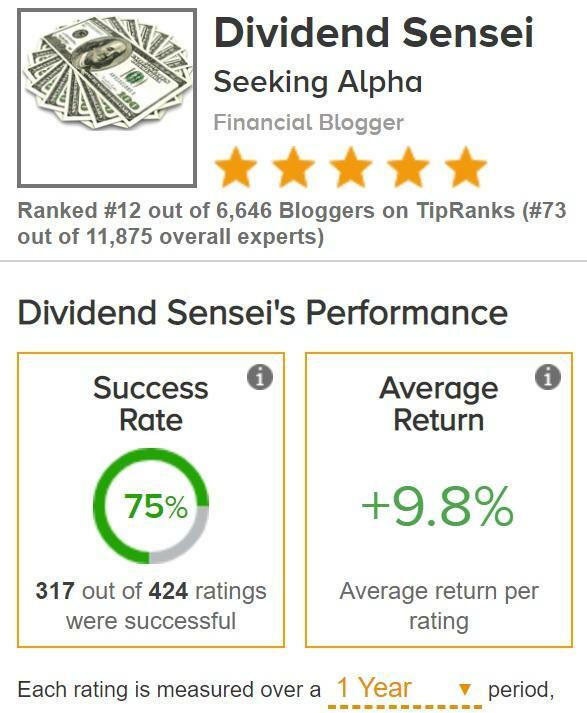 While Tipranks' 12 month forward return success rate is not my specific time horizon and the site is hardly the best measure of analyst quality, the point is that my steadily improving research has put me into the elite of my profession (I'm one of the highest paid investment writers in America). 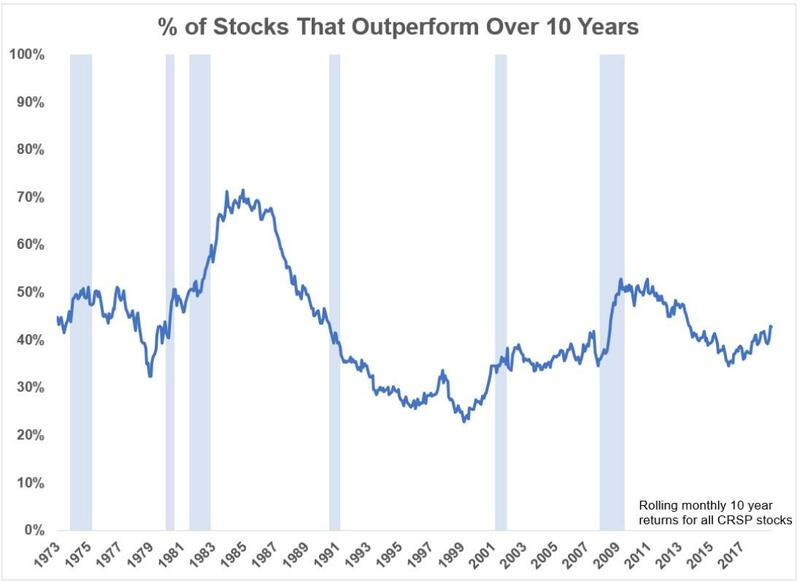 Historically the best investors in history are right 60% to 80% of the time and my success rate has steadily climbed into the higher end of that range. But while I love helping others learn to become better investors and achieve their financial dreams, I'm also a greedy capitalist who wants to, in the words of Shark Tank's Kevin O'Leary "get filthy stinking rich". That means I need to apply the same improvement I've made in my research to my own investments. I recently finished recession-proofing my retirement portfolio by making important fundamental changes, that not just will allow me to sleep like a baby during any future bear market, but more importantly build a massive, safe, and fast-growing stream of dividends that I can eventually retire on. So let me walk you through my vastly improved investing approach, and explain why CVS Health (CVS), Walgreens (WBA), and Bristol-Myers (BMY) are three undervalued blue-chips I hope to buy for my retirement portfolio in the coming weeks. That's why I currently have limit orders set to buy them at fantastic prices that will likely generate excellent income and market-beating double-digit total returns in the coming years. As importantly, learn why AbbVie (ABBV) and Tanger Factory Outlet Centers (SKT) are quality deep value "fat pitch" high-yield blue-chips you might also want to consider buying today. The only reason I don't have limits on ABBV and SKT is that I'm already overweight AbbVie and REITs are 25% of my portfolio (my sector cap limit). The most important change to my investing strategy over the past two years has been an ever greater focus on low-risk investing. That's inspired by two things. First is Buffett's famous maxim about the two core rules of investing "Rule No. 1: Never lose money. Rule No. 2: Never forget rule No. 1." Buffett doesn't mean you can't ever make mistakes and has admitted to making plenty over the past 80 years. Rather he means always first focusing on minimizing the chances of a permanent loss of capital, by having strong risk-management rules in place. The other inspiration is my favorite TV show Shark Tank, in which self-made millionaires and billionaires invest in businesses pitched to them by entrepreneurs from all over America. The majority of each 10-minute segment (edited from 30 min to 2-hour sessions) is about business risk, with the VCs grilling the businessman/women/inventors and trying to punch holes in their bullish thesis. Knowing what could go wrong is often more important than what could go right because it affects a company's risk profile and the probability of actually making money over time. This is why every company focused article I write has a risk section, which sometimes takes up 33% to 50% of the article. Most importantly, I've learned that the real trick to market-beating returns is summed up by the famous saying "offense wins ballgames, but defense wins championships". While the stock market is the greatest wealth creator in history the fact is that the vast majority of the gains come from a few big winners, which offsets a massive amount of losers. 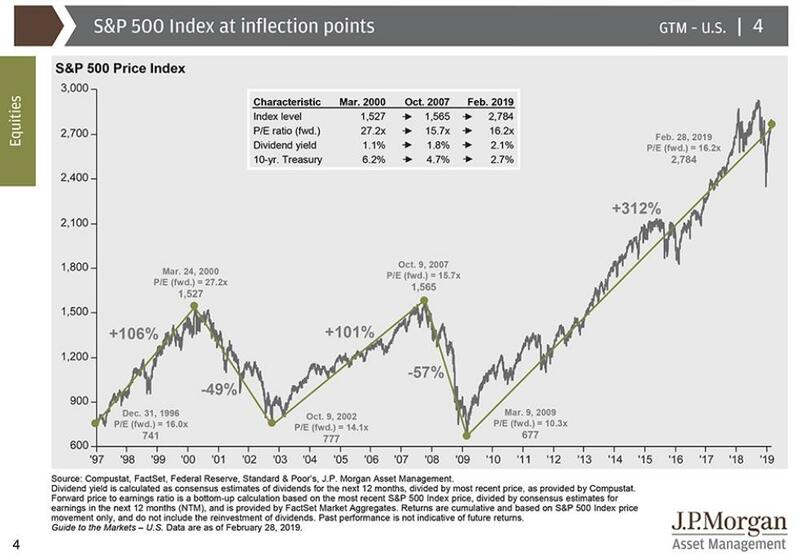 For example, according to JPMorgan Asset Management since 1980 2/3 of the Russell 3000 (a good proxy for the entire US stock market) underperformed the index and a shocking 40% suffered permanent 70+% losses. In fact, the median stock's total returns were negative between 1980 and 2014. And since 1973 the median number of stocks that have outperformed the Russell 3000 over a rolling 10 year period has been 41%. In other words, stock picking, the essence of active management, is hard but not impossible, if you have the right approach. Which is where risk management and company quality comes in. Buffett is famous for his love of wide-moat businesses and the Sharks are relentless in their focus on competitive advantages (or lack thereof) for pitches they hear. This is why I'm now focusing so much on blue-chips and SWAN stocks, both with my retirement portfolio and in my articles. That's for two main reasons. First, as a dividend investor, I care most about safe and rising dividends, across the entire economic/market cycle. Blue-chip US companies tend to avoid cutting dividends even during recessions, especially the ones I'm focused on buying. That includes plenty of dividend aristocrats and kings, who have raised their dividends for 25+ and 50+ consecutive years, respectively. Not just do the aristocrats grow their dividends like clockwork no matter what the market, economy or interest rates are doing, but they have outperformed the S&P 500 (of which they are major parts of) by 25% annually over the past 28 years. And that's with (and because of) 18% less volatility meaning 57% better annual risk-adjusted returns. But I'm not merely buying 100% aristocrats and kings (though you can certainly make a portfolio out of that strategy as I have with my model Bunker Dividend Growth Portfolio which only buys the most undervalued aristocrats and kings at any given time). Rather my goal is to own a highly diverse group of blue-chip and SWAN stocks, in all sectors, each bought at a deep discount to fair value. That's because studies show that starting valuation has a major effect on total returns. 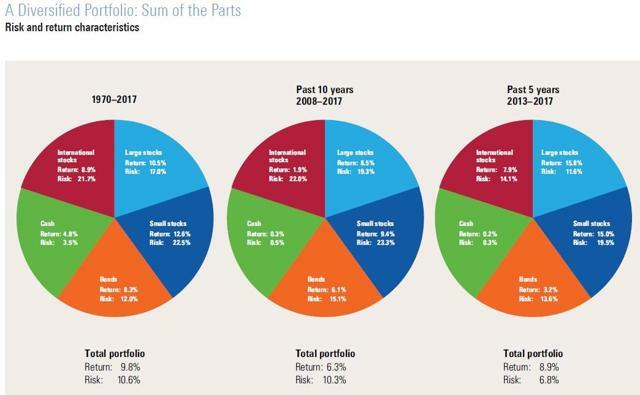 For example, according to JPMorgan Asset Management, since 1994 45% of all total returns for the S&P 500 have been driven by starting valuation. 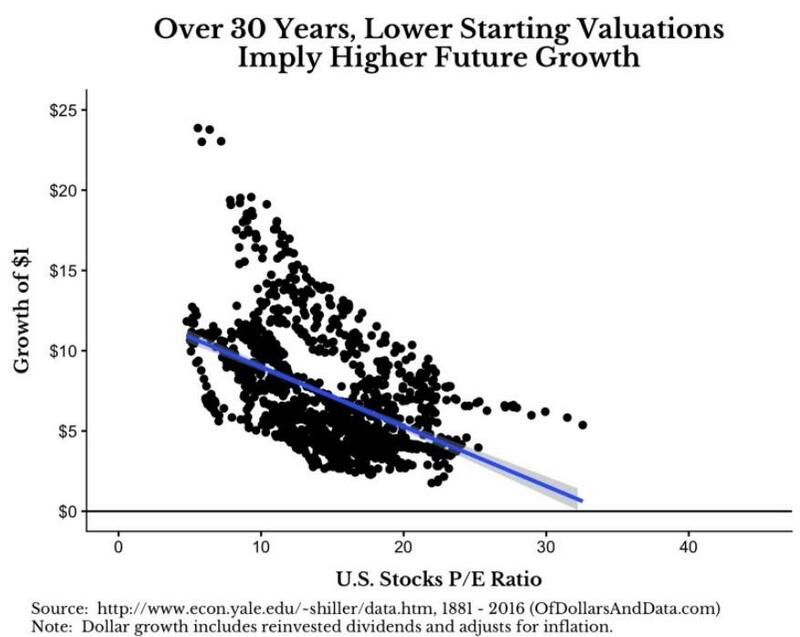 And a Yale study found that, over almost 150 years, starting valuation had significant effects on total returns out to 30 years. Deeply undervalued blue-chips/SWANs are what I consider "ultra-value" dividend stocks or what Buffett calls "fat pitches". These are proven winners, with competitive advantages and quality management/corporate cultures, that are trading at a discount to fair value (high margin of safety) that makes for high probability/low-risk investments. But how can you tell what's a blue-chip/SWAN stock and when it's a great buy? To answer that I've spent the last few weeks constructing a new proprietary master spreadsheet (as part of a business venture I'm working on) that assigns an 11 point Sensei Quality Score to every company in my other watchlists. 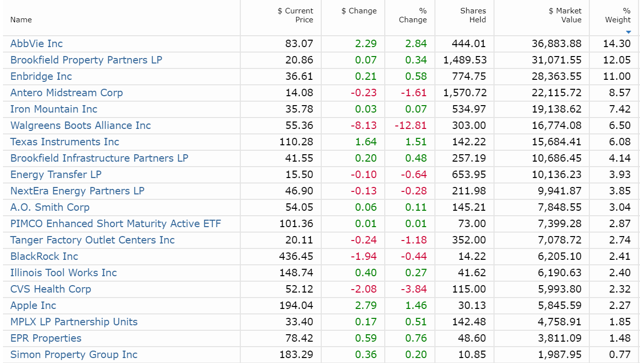 My master watchlist currently tracks 113 companies and I'm adding more as I keep analyzing companies for Simply Safe Dividends (we do deep dives on about 250 companies on an annual basis). Of those 113 companies I'm following 5 are "dirty values", 30 are blue-chips and 78 are SWANs (almost all aristocrats and kings are SWANs). And as to when a blue-chip or SWAN is an ultra-value I've programmed the spreadsheet (in Google Docs) to track the price, 52 week low, and a target price based on the 52 week low. If a blue-chip/SWAN is near its 52 week low AND undervalued based on dividend yield theory (a highly effective valuation approach for blue-chips that's been delivering market-beating returns since 1966) then it's an ultra-value buy. (Source: Investment Quality Trends) - Note IQT's entire system is based exclusively on comparing blue-chip yields to historical yields. According to Hulbert Financial Digest, they have the best 30-year risk-adjusted total returns of any investing newsletter in America. I also programmed a secondary price (near the target price) which I call "being in the batter's box". Companies in the batter's box are like a baseball batter waiting for Buffett's "fat pitch" to take a low-risk/high probability swing. If I have the cash (and the yield curve is positive) I'll set limit orders at my target price for companies in the batter's box. So that's my approach to company selection, risk management, and capital allocation (or at least the valuation portion of it). But a portfolio is like a business. And like running any successful business it requires continuous adaptation, improvement and fine-tuning of the nuances that come from an ever-changing world and US/global economy. So here's the final piece of the puzzle to my retirement portfolio, which is the current capital allocation strategy I'm using. Capital allocation involves two important things, asset allocation (mix of stocks/bonds/cash) and how/when you deploy new money (including dividends). While something good is always on sale (see my 5 fat pitch blue-chips to consider below) it's also true that having dry powder saved up to deploy opportunistically during corrections and bear markets is a good idea. Balancing the two, say between putting your money to work all the time ("time in the market is more important than timing the market") and having some cash saved up to buy during market panics (like December 2018, the worst correction in 10 years) is a nuanced approach for which there is no objectively right answer. After all, corrections, on average, come around every three years, and bear markets about every six. 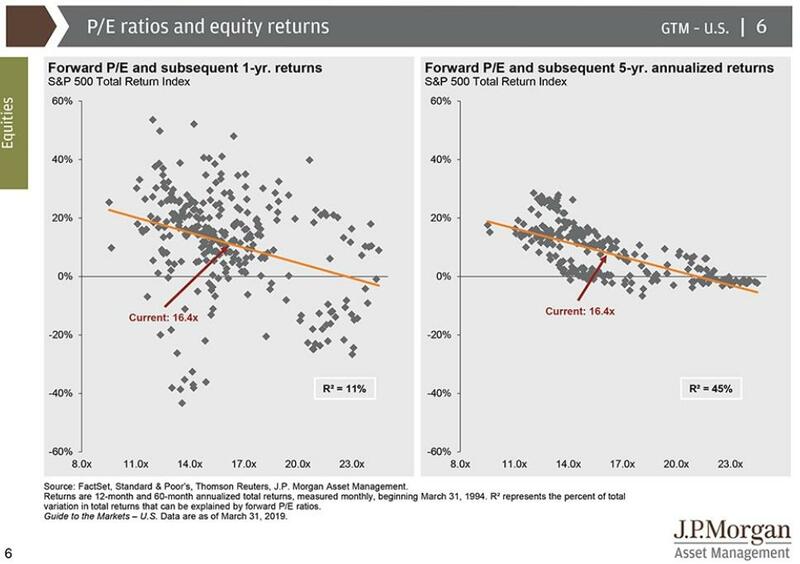 But during bear markets valuations fall to their lowest levels allowing for maximum long-term returns. December 24th saw the S&P 500's forward PE fall to 13.7, which is below where the market bottomed after the tech crash (and mild 2001 recession). My personal capital allocation strategy ties into my asset allocation. Because I'm 32m have a 50+ year time horizon, a very high income, savings rate, and VA disability pension, I can afford to own far more stocks than most people (technically 100%). However, that doesn't necessarily mean that I'm 100% in stocks all the time because bonds serve a very useful purpose, both for me and most of my readers. Stocks and bonds, despite what some investors believe, are NOT the same thing. No dividend stock is a true bond alternative because bonds are a separate asset class, whose primary goal is to be counter-cyclical to stocks. In other words, when stocks are crashing in a recession bonds are generally rising (including T-bills which are a cash equivalent) due to flight to safety and falling interest rates. 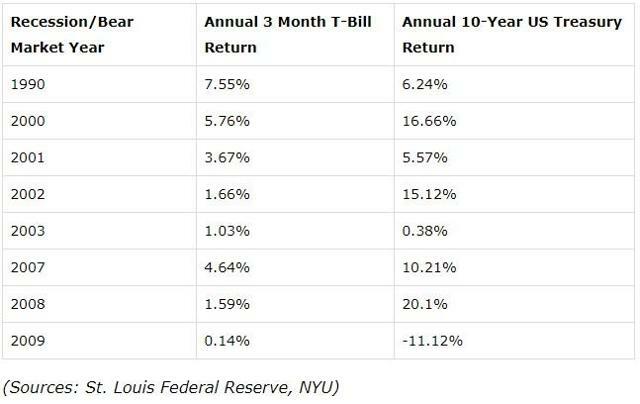 The longer the duration of the bonds, the more rate sensitive they are and the bigger the appreciation during a bear market. Here's a good example of a well-diversified portfolio (for most people). It has a large amount of cash and bonds that are stable or appreciate in value during a bear market. In other words, cash and bonds are income producing assets you can sell at breakeven or a profit to meet expenses during a recession/bear market. Since WWII there has never been a recession without a bear market, and the average recessionary bear market sees stocks fall 37% from all-time highs over 13 months. 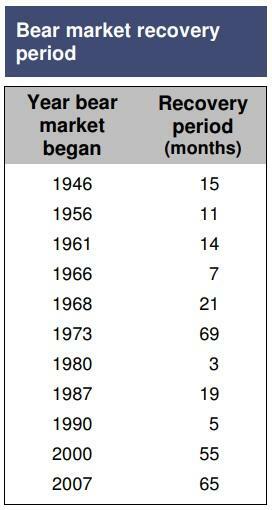 It then takes about 22 months for stocks to recover new all-time highs meaning the average bear market lasts three years from market peak to market peak. But historical averages are just a rough guide of what is likely to happen, not a guarantee of what will happen. 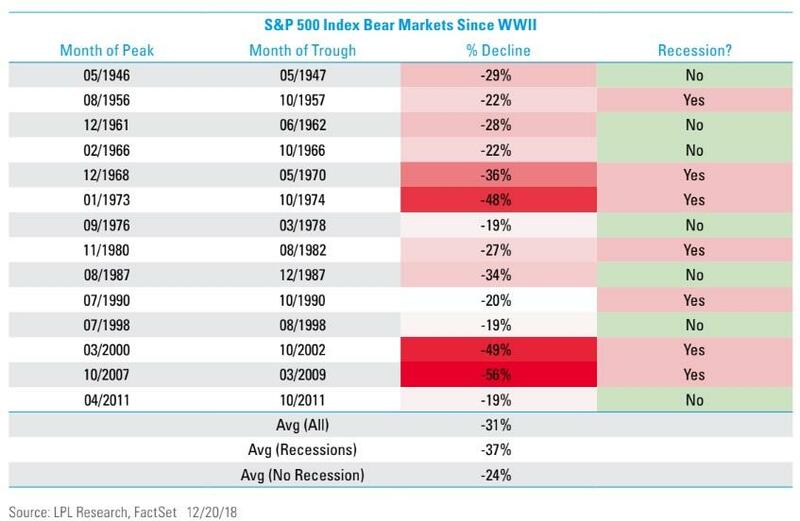 Each bear market is different with some being mild (1990's mild recessionary 20% decline) and taking just five months to recover new highs, and some being especially brutal. That includes the Financial Crisis where stocks fell 57% and took 5.5 years to recover and 1973's 50% crash that took almost six years for stocks to claw their way back. This is why risk management is important via proper asset allocation. Cash is what you sell first in a bear market, then bonds and stocks are the assets you liquidate at the very end if you absolutely have no choice. 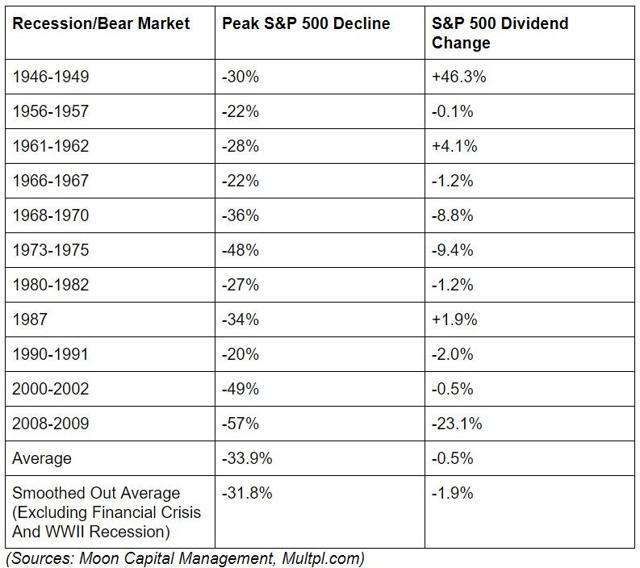 Remember that even aristocrats and kings, the bluest of the blue-chip dividend stocks, tend to decline in recessions/bear markets. They outperform over time by falling less during downturns and keeping up during bull markets, which explains why lower volatility is one of the top five proven alpha strategies you can use. But the point is that while dividend blue-chips and SWANs are lower volatility, they still fall during a bear market. This is why NO DIVIDEND STOCK IS A TRUE BOND ALTERNATIVE. If you will need to sell portfolio assets to meet expenses in the coming years (like retirees using the 4% rule), and your portfolio isn't large enough to live off dividends alone, you NEED TO OWN SOME CASH/BONDS. MINT is an ultra-short duration T-bill ETF run by PIMCO that owns risk-free sovereign debt (US and European). It's a 5 star Morningstar rated cash equivalent who management runs with the direct goal of being as cash like as possible (but yields 2.4%). VGLT is a bond ETF with a duration of 17 so it's a strong hedge in a recession and will give me an appreciating asset to sell once stocks hit -20% (when I start buying ultra-value SWANs and Blue-chips). I used the March 22nd yield curve inversion to pull the trigger on completing my recession-proofing protocol which involved eliminating all margin and high-risk stocks. Now that's possibly being too conservative because there is actually a 10 day confirmation period of the yield curve. 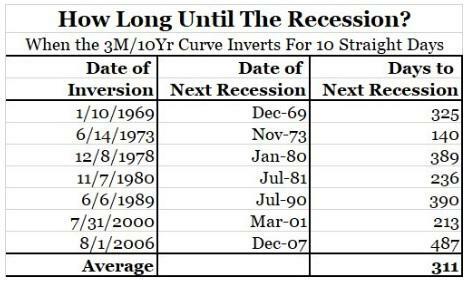 Since 1969 anytime the curve has remained negative for 10 consecutive days a recession (and bear market) has always followed within 16 months. The nature of statistics/probabilities means that seven data points aren't a guarantee that this 10-day confirmation (yield curve went positive on day six) means a recession is guaranteed, merely that recession risks rise significantly. It's important to note that I am not selling my blue-chip stock portfolio. That's for two reasons. First, the nature of all economic forecasting is probabilistic. Even if the yield curve had stayed negative since March 22nd (it's currently positive) that doesn't mean a bear market is 100% for certain coming. And since my portfolio's job is to deliver generous, safe and fast-growing income (from companies I've all bought during corrections or at fire-sale prices) the historical data/studies are clear: hold until the thesis breaks (or you absolutely need the money). Today my portfolio has a 4.9% yield on cost and dividend growth rate of 14% (5-year average). In fact, whenever the yield-curve is positive then I'm looking to tap my bonds to buy ultra-value dividend stocks. That's why, as I'll explain in separate company-specific articles, I've been buying CVS and Walgreens aggressively ($18,000 worth over a three day period). Remember my risk-profile is such that I have no need to actually own bonds to pay bills during a recession. Thus I put my money to work into great companies at wonderful valuations whenever the probabilities of a recession are at 50% or below (such as a positive yield curve environment). 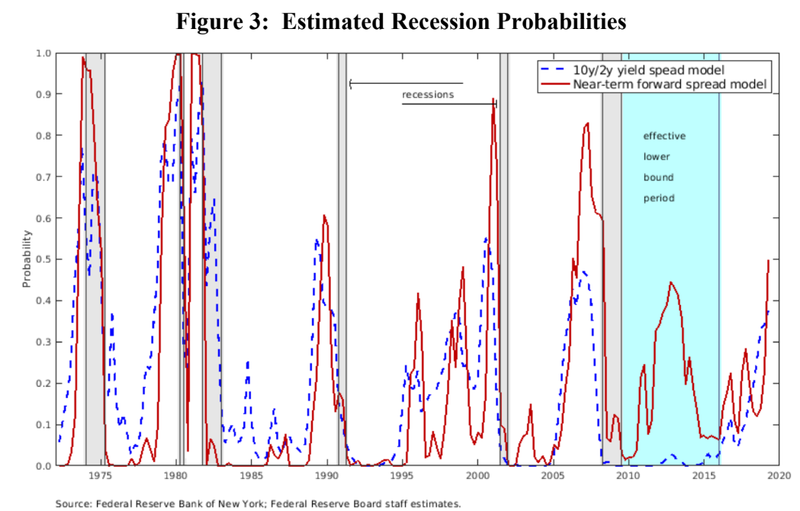 According to the New York Fed right now the flat as a pancake yield curve means 12-month recession risk is about 50%. Since I'm a long-term bull on the economy and stock market and have no love of bonds (just a cash equivalent for me) I'm eager to put my savings to work into fat pitch blue-chip opportunities. Now it's important to point out that this yield curve based approach to saving up dry powder is NOT the perfect strategy. It's merely one that serves as a low-risk capital allocation tool for me to save up cash for bargain hunting later. There are many good capital allocation strategies including dollar cost averaging (the best default option for most people) and DRIPing dividends. That's what both my model portfolios do because my goal is to provide good investing advice to as many people as possible. This is why I continue to offer my weekly watchlist series of the best dividend stocks to buy right now and write actionable articles about undervalued dividends stocks to consider for your portfolio. Which brings me to the top 5 "fat pitches" to consider buying today, including three that I have limit buy orders on right now. The way I set my new proprietary master watchlist (which I call Greenlist because it's been making me money since I started using it) is so it can provide me real-time actionable investing ideas, which I can use to place limit orders on ultra-value "fat pitch" blue-chips and SWANs. This allows me to sort the 113 (and growing) watchlist by those companies that are in the batter's box and then set limit orders (when the yield curve is positive and I have cash to deploy) for ultra-value blue-chip dividend stocks. I've bolded the companies that are active buy considerations, with Vodafone (VOD) representing a level 7 "dirty value" that, while a great potential opportunity (it's a holding in my 80 stock highly diversified model Deep Value Dividend Growth Portfolio) doesn't meet my personal retirement portfolio's risk profile. I'm only considering level 8+ blue-chips and SWANs, which right now means five companies are in the batter's box or active recs (swing away on these fat pitches). The yield curve inversion triggered my deleveraging which meant that I ended up with zero margin and about $22K in dry powder (from the sale of high-risk stocks like IIPR at a 93% profit). As soon as the curve went positive last week I was able to buy an initial $2K position in CVS. Why just $2K? Because I like to keep lots of buying power in reserve in case ultra-value blue-chips keep falling. When it comes to level 8+ quality blue-chips and SWANs I'm happy to "catch a falling knife" and lower my cost basis in a mad flurry of opportunistic buying ("be greedy when others are fearful"). While some readers will scoff at such a contrarian approach it's worked well for me in the past. All my biggest gainers have been bought during corrections with small but frequent and tightly packed limit orders that allowed me to approximately catch the bottom. In fact, EPR Properties (EPR), one of the best high-yield monthly dividend payers you've never heard of, is my highest yield on cost holding (8.0%) and has returned 47% including dividends in the one year I've owned it. A.O Smith (AOS), my favorite way to profit from China and India's fast-growing economies (and a dividend aristocrat) I pounded away on with limit after limit during the last correction and six months later am sitting on a 23.5% total return. Literally, every big winner I have is a result of buying during times of peak panic (mostly during corrections) and fearlessly adding at steadily lower prices. When you only invest in quality blue-chips and SWANs the chances that "this time is different" and the thesis is actually broken are much lower. The probability of the valuation reverting to historical levels is relatively high and thus you can earn very strong, high-risk style returns but with low-risk blue-chips. This is why this week, when Walgreens crashed 13% after its terrible earnings report (and took CVS down about 5% in sympathy at one point) the limits I place on fat pitch blue-chips ahead of earnings, in case of just such a freakout, triggered in a mad wave of opportunistic buying. Walgreens gapped down 12% at the open, triggering five limit orders for $2K at $55.83. A 6th limit triggered at $55.24 when the stock bottomed at -13%. This allowed me to triple my invested capital in Walgreens, whose management believes will still deliver 5% to 9% long-term earnings, cash flow, and dividend growth over time (starting in 2021). I bought Walgreens at a 3% yield (highest in seven years), a PE of 9, and the lowest share price in five years. For a SWAN of this caliber, this kind of multi-year low buying binge is a low-risk, high-probability investment. Mid-range growth guidance plus a 3% yield = 10% long-term total return potential even ignoring the fact that, if management delivers on its growth plans, the PE is likely to soar about 50%. That's based on Walgreen's historical PE and Chuck Carnevale's rule of thumb 15 = fair value PE for most companies. CVS (the most undervalued blue-chip in America right now) I managed to pick up initially at $53.91 (standard $2K order), then again at $52.75 and $51.91 on Tuesday, April 2nd. I literally got CVS at a six-year low, and eight times cash flow (a VC like valuation). Best of all my cost basis on both stocks is essentially at these current multi-year lows. In other words, I've now loaded up to the tune of $25K into quality, deep value coiled springs that are likely to join the ranks of my big winners over the next year or two. But since I'm not using margin anymore, that flurry of buying meant that my dry powder has fallen to just four more limits (9 over the last three days). 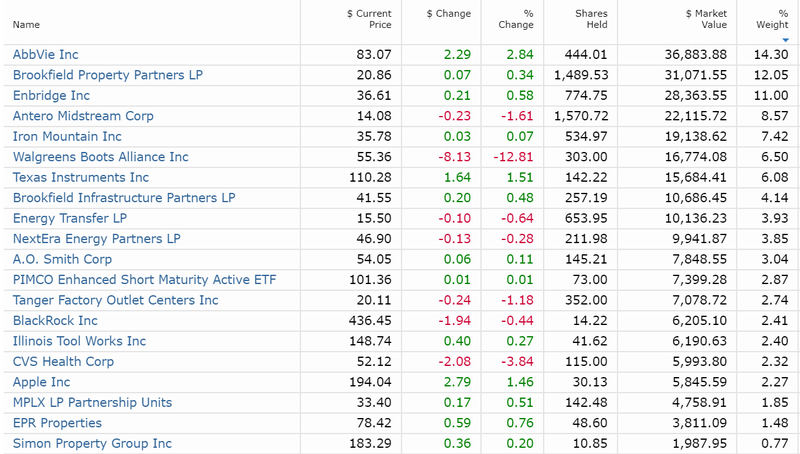 Which brings me back to the Top 5 "fat pitch" blue-chips, which I consider very strong buys for nearly any diversified dividend portfolio today. But If SKT, ABBV, CVS, WBA, and BMY are all active buys or approaching my target prices, then why do I have limit orders in place for just those last three? While I consider all five companies great fat pitch blue-chip buys today, there are important personal portfolio reasons why I'm being so selective with deploying my capital. Remember that running a portfolio is like running a business. That means you need not just good stock selection but a sound capital allocation strategy and most of all, the right risk-management approach that meets your needs. One of my risk management rules is 10% position size caps and 25% sector caps. Thanks to my deleveraging over the past few weeks (selling higher risk stocks at a profit to get to zero margin) the concentrations of all my remaining holdings went up a lot. This is why my top three holdings are all now above my 10% position cap. I'm not going to sell great companies I bought at amazing valuations since they are all safe blue-chips I trust to keep paying rising dividends even in a recession. I'll just avoid buying more until I can dilute them down to under 10% via my high weekly savings rate (plus over $12,000 per year in fast-growing dividends). Thus, while I consider AbbVie a very strong buy right now, I don't have any limits on it. 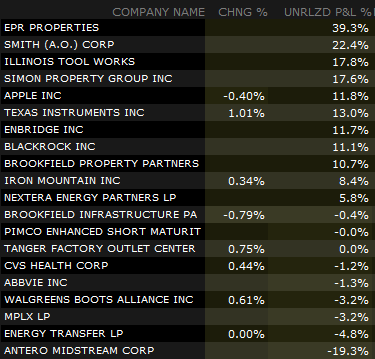 Tanger isn't on my limit order buy list because I'm already 25% in REITs, which is my sector cap. I spent the last two years loading up on undervalued sectors, including midstream MLPs and c-Corps, and REITs (mostly 2018's early correction when the sector hit its bear market bottom). As a result, I'm now at my sector cap for both. And because healthcare is now arguably the most undervalued sector, I've been focusing on companies like Walgreens, CVS, and Bristol for my limit orders, in order to put my money to work in the best deep value blue-chip opportunities. If all my limits trigger (I have the cash for four of them, $8K worth of stock) then I'll be 20% in healthcare. 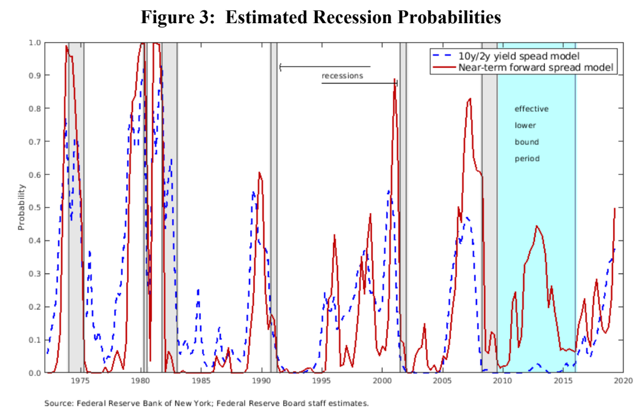 What if the yield curve inverts again, and stays negative for 10 consecutive days indicating that a recession is likely in 2020? Well, I'll have no regrets because I've bought great recession-resistant companies at fire-sale prices (and single digit cash flow multiples) which will keep paying me secure dividends no matter what the economy or market does. How do I know? While history doesn't ever repeat exactly, as the saying goes it often rhymes. And the dividend track record of my retirement portfolio is excellent. 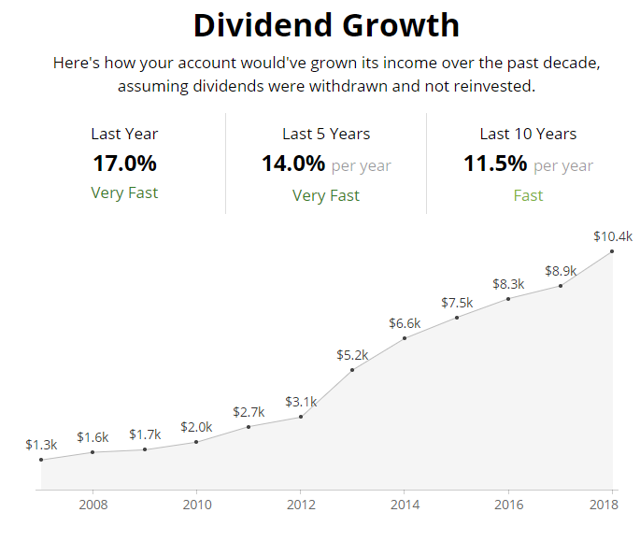 Not even the worst recession since the Great Depression was able to reduce my income stream, and the dividend growth rate has been not just double-digits but accelerating over time. Obviously, that can't continue indefinitely, especially not in a recession. But the point is that my portfolio is a cash flow focused holding company whose subsidiaries have just one job to do. Pay me a generous (4.9% yield on cost), safe (recession-resistant), and fast-growing income over time, so that I can retire on dividends alone. I'm highly confident that my retirement portfolio will live up to that goal, especially as I steadily add great blue-chips at wonderful prices over the coming years and decades. By no means am I saying that I've mastered the art of investing, or come up with a full-proof "can't lose" strategy that ensures your champagne wishes and caviar dreams will become reality. Even Buffett, the greatest investor of all time, spends 80% of his day reading and says that life long learning and self-improvement is critical to investing success. Rather my current retirement portfolio strategy, including its capital allocation, and risk management protocols, is based on my never-ending drive to continually fine-tune and improve my own investing returns. While some have criticized me for "changing strategies every few months" in reality I've been running my portfolio like a business (which is the smart way to think of your savings). That means steadily moving towards a lower-risk/higher probability strategy that hasn't just worked great over decades, but has steadily improved my own article recommendations and my portfolio's returns. Running your business based on facts and data is the only logical or successful way to operate and the same applies to your investing portfolio. Eliminating margin and now taking a 100% value driven, blue-chip/SWAN focus is a solid long-term strategy, backed up by market data, which offers me the best opportunities to achieve high-risk style returns with low-risk dividend growth stocks. Towards that end, I wanted to highlight why AbbVie, Tanger, CVS, Walgreens, and Bristol-Myers are five of my top recommendations for "fat pitch" dividend blue-chips right now. While I consider them great additions to any diversified income portfolio, due to my current overweighting of AbbVie, and REITs being at my 25% sector cap, I'm only considering buying Bristol, Walgreens, and CVS with my remaining cash (about 3% of my portfolio right now). I must stress that I'm not a market timer (other than in the contrarian investor sense) and am NOT calling a bottom on these companies. I'm merely saying that based on my assessment of their quality and long-term growth prospects, all five are likely to deliver solid market-beating returns in the coming years while delivering safe and recession-resistant dividends along the way. After all, buying quality companies at five and six-year lows (10 years for Tanger) is likely to mean they are relatively close to the eventual bottom. But remember that diversification and proper asset allocation are important because there are no guarantees on Wall Street. You can only make educated, high-probability investments that fit with your risk-profile and long-term goals. Fortunately, if you have the right watchlists of companies, and wait for "fat pitches" as highlighted today, you're likely to be right far more often than not, resulting in great returns and a steadily rising stream of safe dividends that can help you achieve your financial goals. That's especially true if you use the right risk management, such as limiting your position sizes just in case a blue-chip/SWAN thesis breaks and you have to sell when the bullish thesis deteriorates past a certain point. Limiting your downside via the use of quality dividend stocks, bought at great prices, and then patiently waiting for the thesis to play out, is the best approach I can think of to growing both your income and wealth over time. 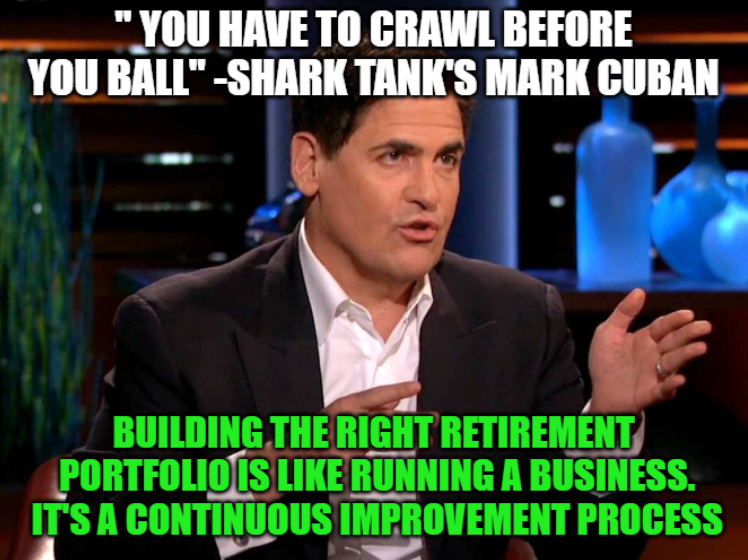 That's why I have my life savings invested in this strategy, which I'll keep improving over time (and updating you as I do), as I continue on my life long learning journey. Disclosure: I am/we are long ABBV, CVS, WBA, SKT, BMY, EPR, AOS, MINT. I wrote this article myself, and it expresses my own opinions. I am not receiving compensation for it (other than from Seeking Alpha). I have no business relationship with any company whose stock is mentioned in this article.